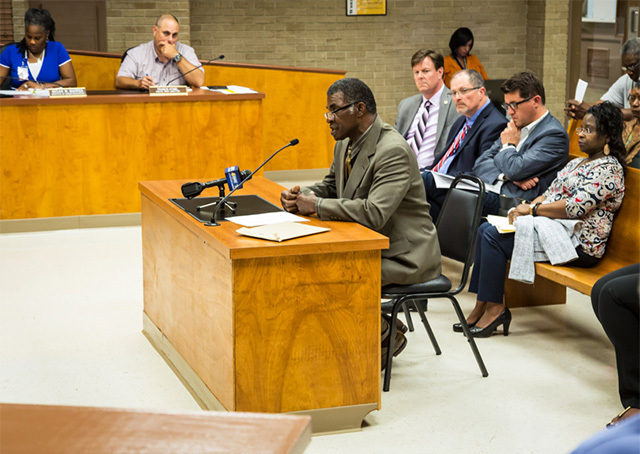 Pastor Harry Joseph of the Mount Triumph Baptist Church in St. James, Louisiana, is taking legal action to prevent the Bayou Bridge pipeline from being built in his community, roughly 50 miles west of New Orleans. He is named as a plaintiff in a case filed by the Tulane Environmental Law Clinic, petitioning the Parish Court to overturn the coastal permit that the Louisiana Department of Natural Resources (DNR) gave Energy Transfer Partners, the company that built the controversial Dakota Access pipeline. The Bayou Bridge pipeline will be the last leg of the Dakota Access, carrying oil fracked in North Dakota to Louisiana. The final stretch of the project, if built, will span 162.5 miles from Lake Charles to St. James, cutting through the Atchafalaya Basin, a national heritage area and the country’s largest wetland. This pipeline will transport crude oil from the oil and gas hub in Nederland, Texas, to a terminal in St. James Parish’s Fifth District, a small, predominately low-income African-American community of fewer than 2,000 in a stretch of land along the Mississippi River known as Cancer Alley. Pastor Joseph found out about the Bayou Bridge pipeline shortly after a tornado affected the 5th Ward earlier this year. A power line came down, blocking the only road residents can use to get in and out of the area. It was a stark reminder that the community doesn’t have an evacuation route — and the only alternative road out was closed to the public by an oil storage company that bought the land. “The pipeline is one more risk to our community that we really don’t need,” Joseph told me. The community is already facing the imminent construction of two multi-billion-dollar methanol plants. A Community as “Collateral Damage”? At a hearing for the pipeline permit, Joseph allied himself with environmental groups opposing the pipeline, including Bold Louisiana, Gulf Restoration Network, the Sierra Club, and the Atchafalaya Basinkeeper, which are also part of the lawsuit against DNR. The Louisiana Environmental Action Network has also been helping the community fight against the petrochemical plant permits and other developments adding to air and water pollution in the area. Genevieve Butler, who goes by the name Eve Miller, a representative of the community-based organization H.E.L.P. (Humanitarian Enterprise of Loving People) Association, is also a plaintiff in the lawsuit. Miller and Joseph hold meetings about the pipeline fight the third Monday of each month at the Mount Triumph Baptist Church, which has become a hub for pipeline resistance. Miller describes the community as “collateral damage.” It angers her that, when oil storage facilities started expanding at a rapid clip in 2014, she says white residents in the area were bought out, but not a single black household. Because the Louisiana Tumor Registry doesn’t provide sufficient data to pinpoint elevated cancer rates in specific towns, and no recent health survey has been done, proof that the industrial installations are the cause of people’s cancer isn’t conclusive. However, anecdotal reports from the community are alarming, and the future doesn’t look any better. “We have been told if an accident happens, to shelter-in-place,” Miller told me. “Close windows and doors till you get an all clear. But in our area, houses have shifted because of the ongoing construction — there is no place to stay safe. None of the windows and doors closes tightly.” As we spoke, we could hear banging coming from construction of a new facility on the other side of the levee down the road from Miller. Timmy P. Rousel, the St. James Parish President, responded to the community’s concerns after Pastor Joseph submitted a petition with 400 signatures calling for an evacuation route during a council meeting. In a letter to Joseph, Rousel encouraged residents to identify any frail or elderly who will require emergency assistance to contact their nearest senior center and have family members create an emergency plan ahead of time. “But no plan can help you if the only road in and out of the area is shut down,” Miller pointed out. Lisa Jordan, deputy director of the Tulane Environmental Law Clinic, told me the situation in St. James was one of the worst instances of environmental injustice she has seen. The lack of an evacuation route is a key factor cited in the law clinic’s petition. But that didn’t play into DNR’S original decision to grant the pipeline permit, according to Patrick Courreges, Louisiana DNR communications director. He explained that DNRonly takes into consideration when the proposal would make substantial changes to areas, and that the addition of the Bayou Bridge pipeline to St. James Parish wouldn’t qualify. Can the Law Clinic Win? On June 14, the Tulane Environmental Law Clinic won the reversal of another contentious permit DNR issued in a residential community in Belle River, Louisiana. In that case, DNR granted a permit to FAS Environmental Services that could lead to the expansion of its injection well operation in the Atchafalaya Basin. Like Energy Transfer Partners, FAS Environmental Services has a poor safety record, which played a role in the court’s decision to revoke the permit. Despite the recent legal victory, the odds are stacked against stopping any pipeline in Louisiana. In the last 10 years, DNRhas not turned down a single pipeline permit request. But Pastor Joseph is hopeful that the court system will ultimately help him save his community. Even if Joseph can’t stop the pipeline, the battle against it is shining a light on the grave injustices his community is already facing. He is eager to show anyone around St. James, so others can see and hear for themselves what his community is dealing with. He doesn’t expect to shut down industry there, but ultimately he wants the companies to buy out everyone who wants to leave the area — St. James has around 1,000 residents total — because he says no one will be safe after all the pending industrial developments are completed. He hopes the lawsuit will give pause to the other state and federal agencies yet to decide on Energy Transfer Partners’ remaining permits for the Bayou Bridge pipeline. The company has pending requests for a water quality certificate from the Louisiana Department of Environmental Protection and a permit from the U.S. Army Corps of Engineers. He wonders now if the love of money is so strong that industry leaders and politicians are willing to let people die in order to get it. Not if he can help it, he told me. If the Dakota Access pipeline is completed, the last stretch of the route will be the Bayou Bridge pipeline. Advocates of the Bayou Bridge Pipeline say it’s part of Trump’s America. Resisters are saying no to that vision.